Issu à 100% de très vieilles roussanes, ramassées en légère sur-maturité, ce vin exceptionnel sera à boire avant 2-3 ans ou dans 10 ans, en accompagnement d'une grande gastronomie (poularde aux truffes ...). 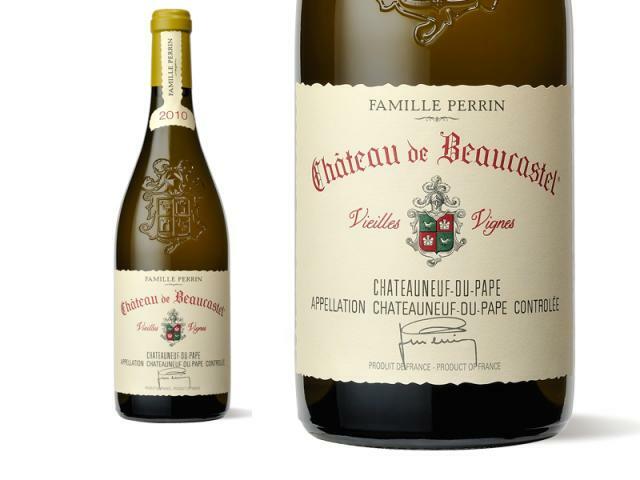 La Famille Perrin possède une véritable culture du vin blanc. Ce 2010 au fruit mature dévoile des notes de coing. La bouche se montre riche mais peu grasse et ciselée par un minéral (sensation de calcaire) très présent. Une belle réussite que l'on peut laisser vieillir vingt ans ou boire déjà sur une viande blanche ou un tajine. Ce 2010 au fruit mature dévoile des notes de coing. La bouche riche mais peu grasse est ciselée par un minéral très présent. "I want to rub myself in it," one taster said, completely seduced by this wine. He wasn't the only one completely smitten by its play of cashew richness and firm warm stone, its billowy satin texture and its quiet wildflower tones. This is exceptional in its vivd portrayal of a place, the heat of the sun on stones and the cool of the air palpable in a sip, and yet it's understated, elegant, the product of a patch of carefully tended roussanne vines that are a quarter-century old. Gras, complet, belle fraîcheur et grand équilibre, longueur ferme. Very rich, this cuts a broad swath, delivering a remarkably lush yet pure core of papaya, mango, green melon and green plum fruit all stitched with macadamia nut, brioche and honeysuckle notes that chime through the superlong finish. There's a great buried stony edge. Roussanne. The 2010 Beaucastel Châteauneuf du Pape Roussanne Vieilles Vignes has off-the-charts richness. Keep in mind, the élévage here is slightly different, as it is aged in one-year-old barrels with a touché of new oak, but like its sibling, no longer undergoes malolactic fermentation. A profound wine with hints of nectarine, mango, subtle smoke, rose petals, this sumptuous, full-throttle wine has unmistakable minerality, a skyscraper-like texture and an amazingly laser-like finish with incredible amounts of glycerin and fruit. Drink it over the next 4-5 years. Although some vintages can last 20-30 years, they undergo radical changes in their evolution, making it almost impossible to guess where they are in evolutionary terms. Light yellow. An explosively perfumed bouquet evokes Meyer lemon, pear skin, jasmine and minerals. Sappy and penetrating, projecting a compelling blend of richness and vivacity. Powerful, incisive orchard fruit and candied citrus qualities put on weight with air and pick up a touch of bitter quinine that carries through the very long, palate-staining finish. Marc Perrin told me that it's a mistake to associate roussanne exclusively with opulence "because when it's planted on limestone it keeps its freshness. The numbers are low on paper but what's in the glass is bright and contradicts the math and oenologists' predictions. Three hectares planted 1909. (Some of that material shipped to Tablas Creek in California.) 'More and more we believe Roussanne is a great grape for hot climates, especially on limestone, not because it is acidic – it’s not – but deep roots extract minerality which adds a sort of iodine, refreshing quality. Consultant oenologist would say you had to acidify...' Just 6,000 bottles a year. Marked gold already. Stern marzipan nose. Very tight and young. Hidden depths. Very long and satin texture. Mineral streak here. I’d wait for one of its two periods in its prime. Drink dates refer to the first.